The club has 7 courts in total, 3 of which have a flexible acrylic surface with the other 4 having top quality synthetic grass. The courts are laid out with a central clubhouse (see aerial view by selecting satellite on the map page and zooming in) with the 3 acrylic courts on one side and the 4 grass on the other. The large panoramic windows of the clubhouse offer viewing of all courts from both the bar lounge and main hall area. 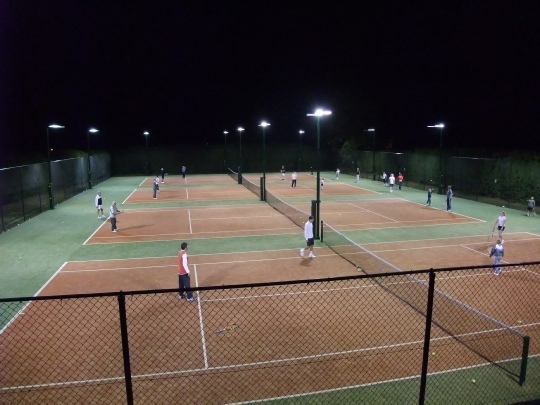 All of the courts are surrounded by a dense 4 metre high hedge which gives perfect visibility for striking the ball along with increased protection from the elements on windy days for both players and spectators. These 3 courts are a smooth type of surface with an integrated rubber beneath the surface. They offer a 100% consistent bounce and are recognised as being the most ‘true’ of all playing surfaces. Almost all club matches are played on these 3 courts. 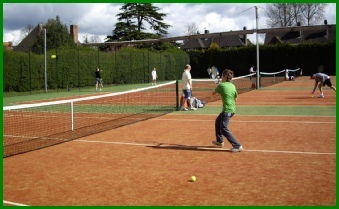 The 4 artificial grass courts were newly laid in 2007 and are lovely to play on. They are a dense carpet filled with very fine sand which provides a superb playing surface that is both very forgiving on the muscles and joints whilst also being very ‘true’. 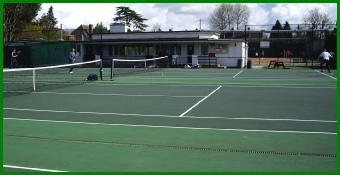 They are the most popular courts for general club play. They also offer superb drainage and play can take place immediately even after the most torrential rainstorm with. They are also unaffected by frost and are very slip resistant in winter. 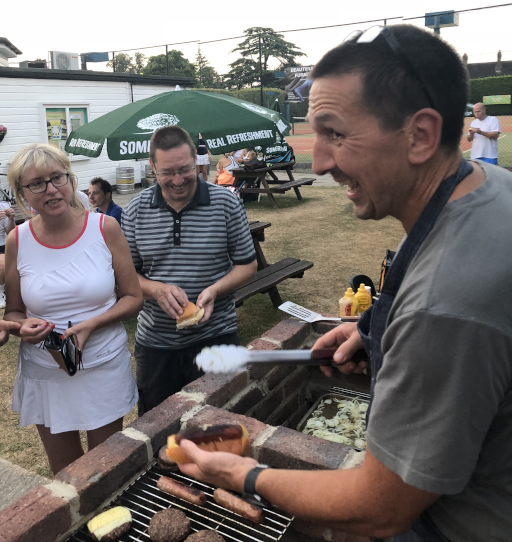 The club is situated in the middle of the Gidea Park conservation area and as such is very secluded and offers perfect peace and tranquillity for playing or watching tennis. We have an extremely warm and welcoming bar lounge that is separate from the main hall but is connected via 2 pairs of double doors that can be removed for social functions. The bar has a full license and sells draft and bottled beers plus a full range of wine and spirits, all of which are at prices much cheaper than in local pubs. We have a 7 foot pool table in the bar which is very popular, along with darts, table football and table tennis in the main hall. There is also a full kitchen along with separate ladies’ and men’s changing rooms and showers. The club is a one minute walk from Main Road, Romford which is a main bus route with services throughout Havering. The club Is also approximately half a mile from Gidea Park Station which is on the Liverpool St/Southend Line.